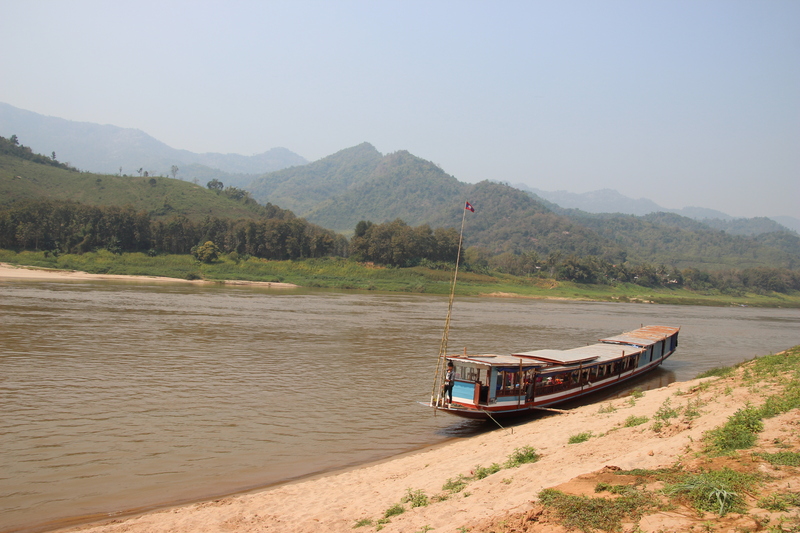 Having not learnt from our earlier lesson of taking boat rides along the Mekong, we decided to journey to our next destination of Laos’s Luang Prabang by exactly that mode of transport. 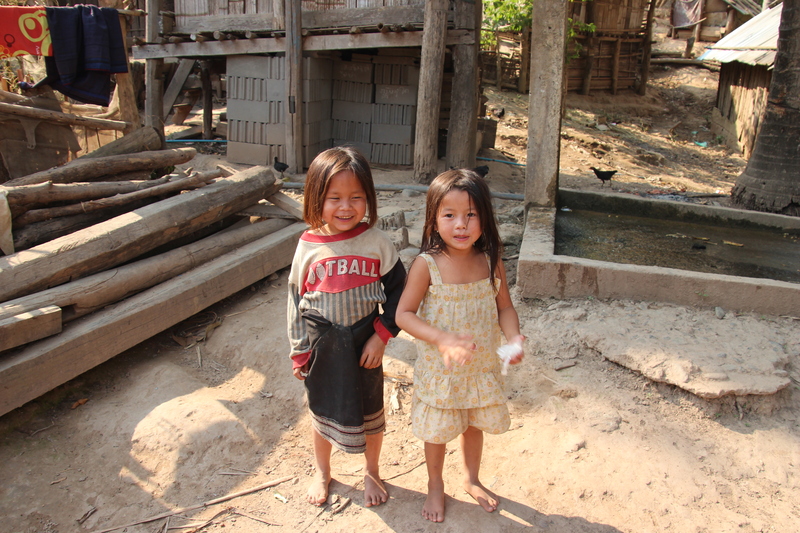 Luckily for us, Mekong boat rides seem to approve on acquaintance and we had a great time. Our trip started with a 7 hour bus journey from Chiang Mai to the Thai – Laos border, from which it was a hop, skip and a jump (ie. Tuk tuk ride) to the port town of Hue Xai, where we would board our vessel. 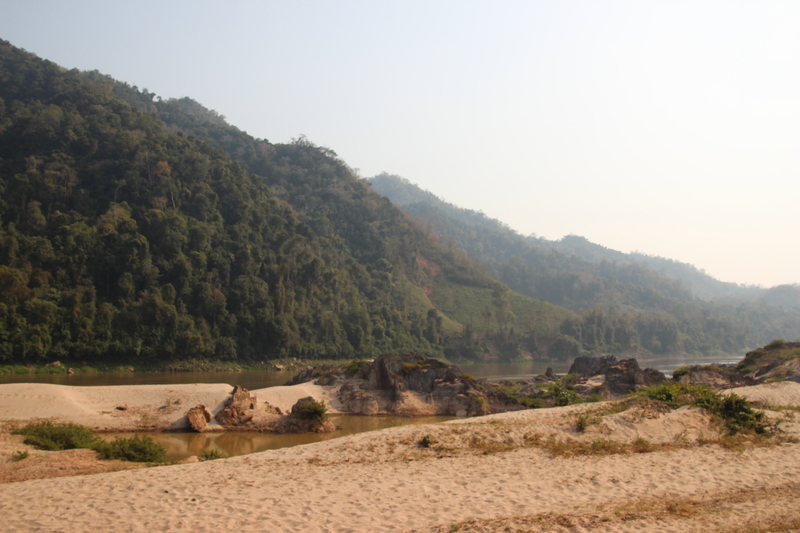 We spent the evening celebrating our 9 year anniversary in this sleepy town with riverside beers, Laos Whisky (honey flavoured and ginger flavoured) and a BBQ chicken dinner in a hippy run commune for Laos Mountain women. 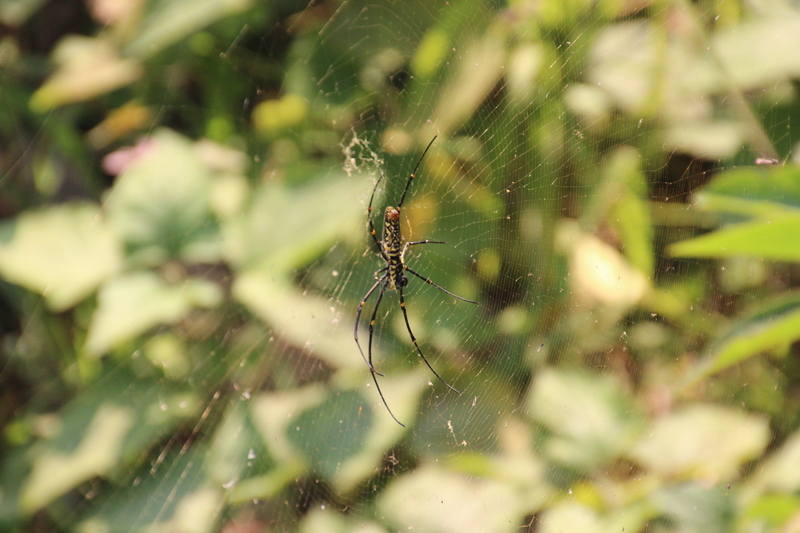 Oh and we saw a really, really big spider. In the morning, we hopped aboard the wooden long slow-boat that would be our home for the next two days, and were not unpleasantly surprised. Amongst the highlights for me were all-you-can-drink cups of tea (it’s been so hard to get a decent cup of tea! 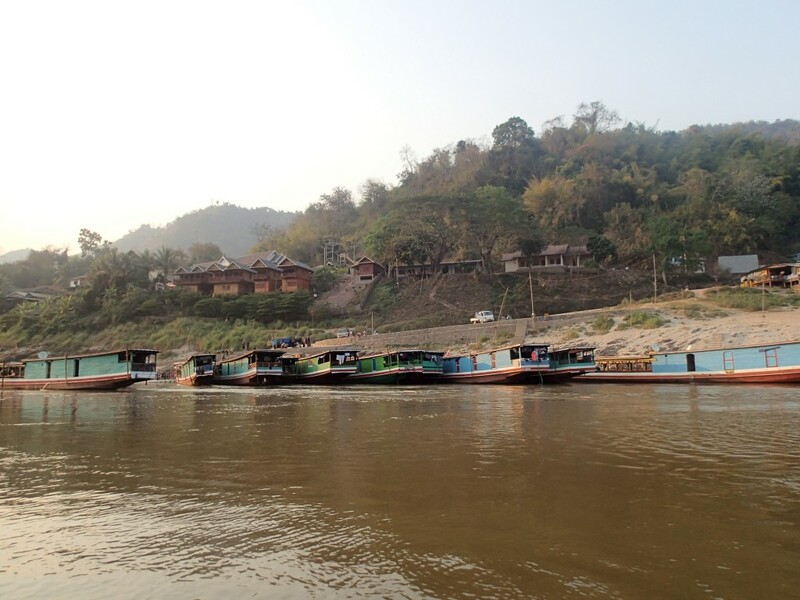 ), an on-board toilet (luxury) and the rolling views of the Mekong. What more could you want? Our journey was around 8/9 hours long each of the two days, broken by a few stops to visit tribal villages along the way. As usual we found this a bit weird. 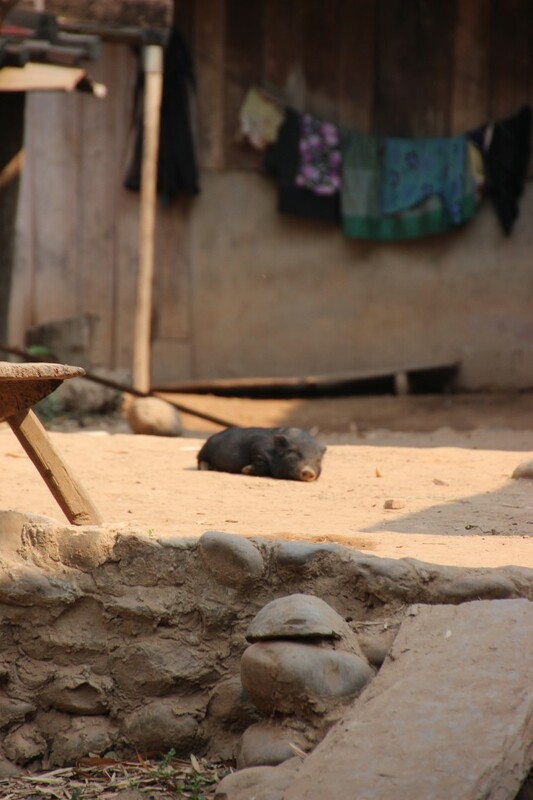 It is really, really fascinating to walk around such villages and to see communities living so very different lives to what we are used to or even what we have even see before, and for that aspect I have to say that I did get something out of the experience. On the other hand, to take part in such a voyeuristic activity felt awkward, patronising and ultimately wrong. Although the villages are ostensibly authentic examples of either Kamu or Mein (pronounced Mon) tribal villages, the presence of tourism and modern day life can be seen everywhere in the handicraft markets set up for our arrival, as well as the sky dishes and plastic sweet wrappers to be seen everywhere. It seems such a shame that their way of life is changing so rapidly and so obviously, largely due to the likes of us. 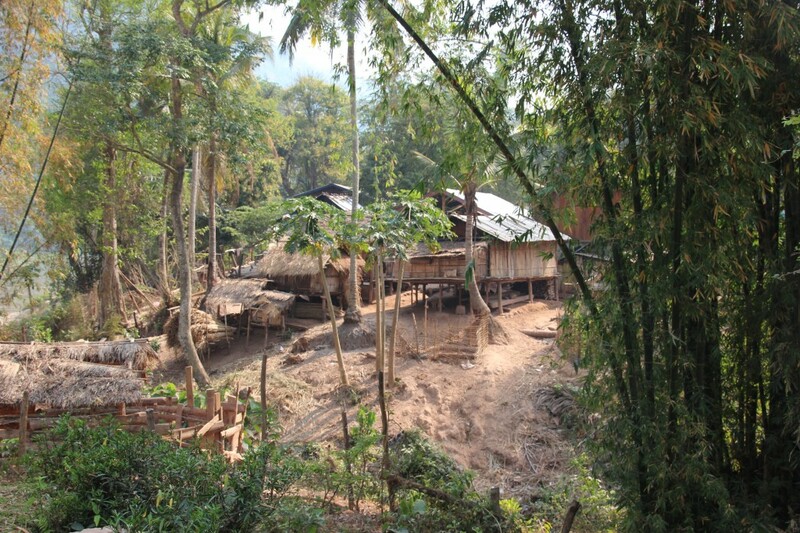 We stopped overnight in the small village of Pak Beng, on a hillside above the Mekong. Chickens and pigs were almost as plentiful as people, and unfortunately I had a hard time resisting the flea-ridden kittens. Halfway through dinner there was a town-wide powercut, so on the walk back to the hotel our way was lit by just candles and stars (and we still managed to avoid tripping over chickens). 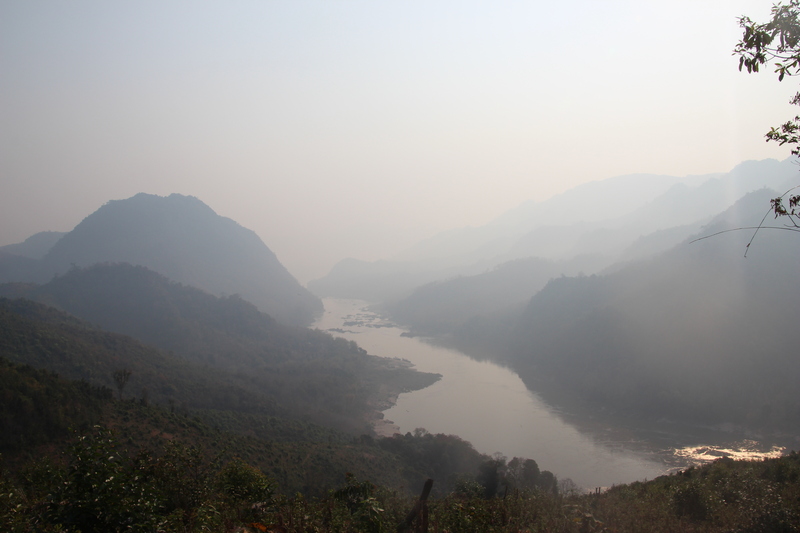 An early start in the morning had us up and out on the mist covered Mekong and we wrapped up against the chill breeze. 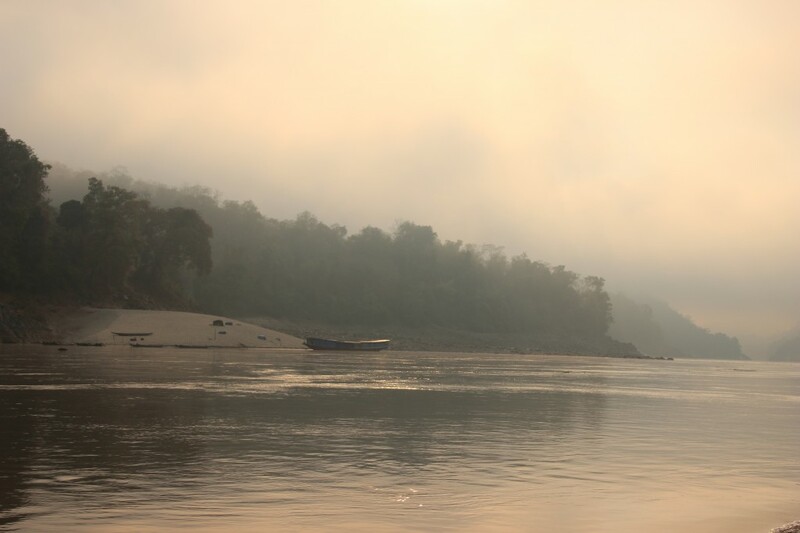 The low hanging fog gave the river the appearance of a Chinese watercolour – or a scene out of Avatar – whichever way your mind is so inclined. It was a lovely way to travel. 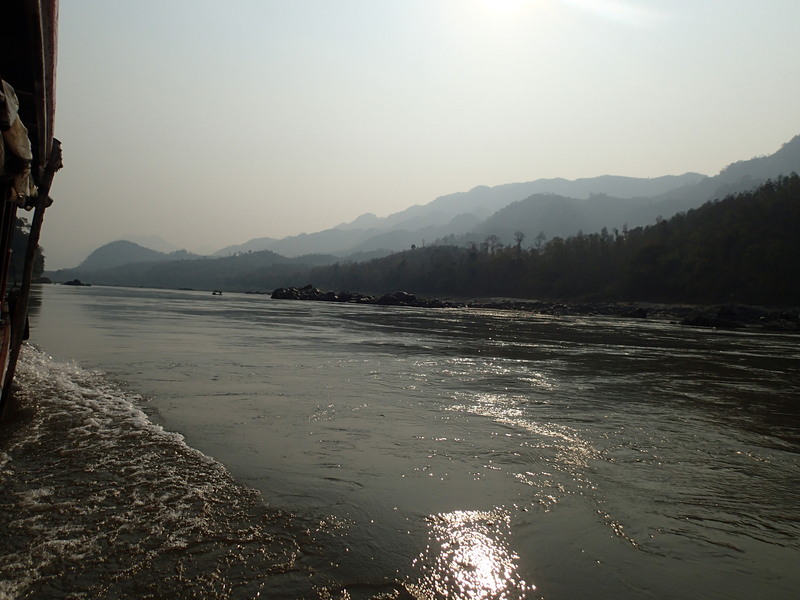 The slow speed of the boat gave enough time to really drink in the surroundings; the occasional rocking as we went over various eddies and faster flowing currents was, more than anything, relaxing in its gentle sway. 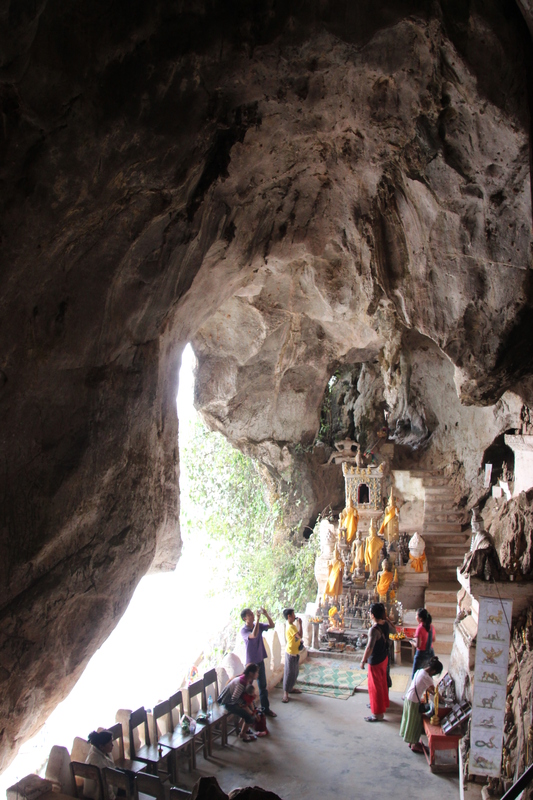 A few hours from Luang Prabang we stopped at the Pak Ou caves, the shadowy enclaves of which are filled with golden Buddha statues. Hence lots of tripping-over tourists trying to take photos in the dark. 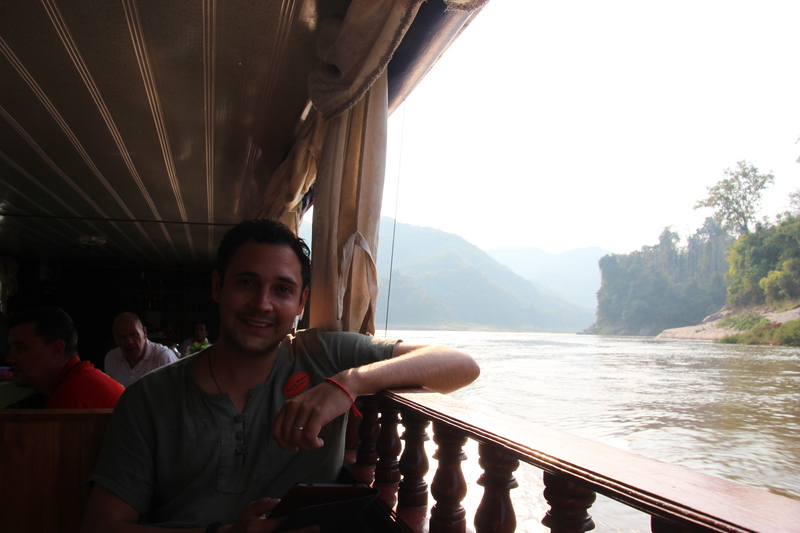 And then it was straight to Luang Prabang! 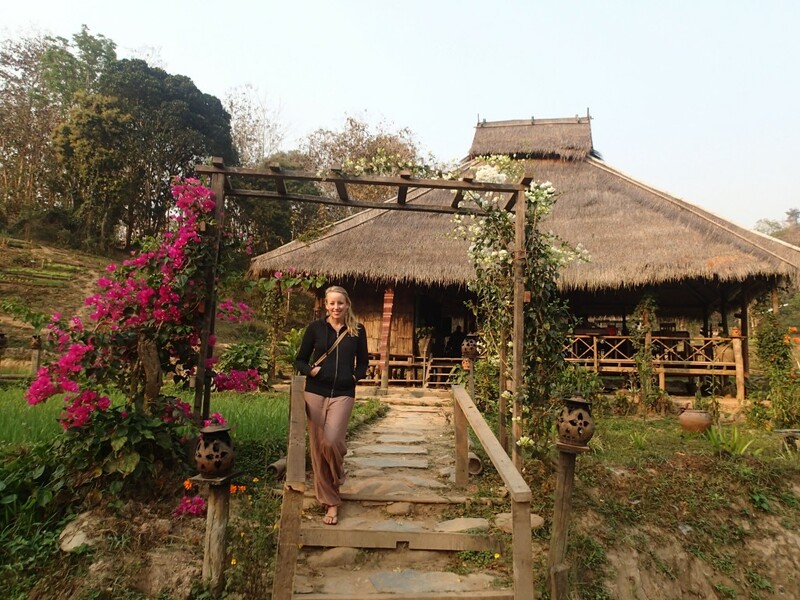 We’d booked just a night here to begin with but we were to return after our trip to the Kamu Lodge, so we were able to enjoy our one evening without too much pressure to explore. We wandered through the busy night market then down the main street and settled for a Laos style dinner with a French influence: delectably oily fried spring rolls; fish cerviche cured with spiky lime and holy basil; pork kebabs with a rich penang curry sauce and; Nick’s old favourite, chicken satay with peanut sauce. 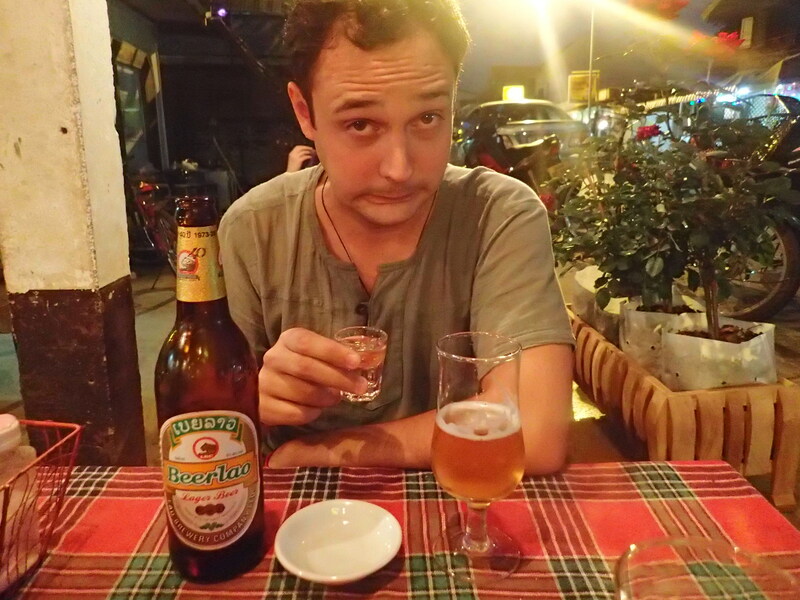 A great start to our stay in Luang Prabang. But for the rest of our stay in Luang Prabang we were to wait two nights, having before we arrived booked an excursion out of the town to an Eco Lodge downriver. Little did we know when booking it that this particular downriver was back 3 hours the way we’d come only the day before, but it did give us another chance to repeat part of the gorgeous watery voyage. 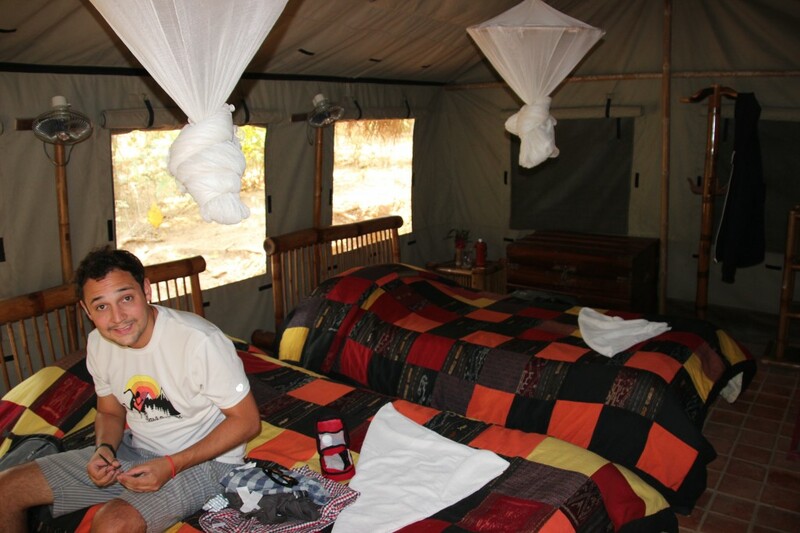 When booking the two-night stay at Kamu Lodge we had originally been looking for a trekking trip. 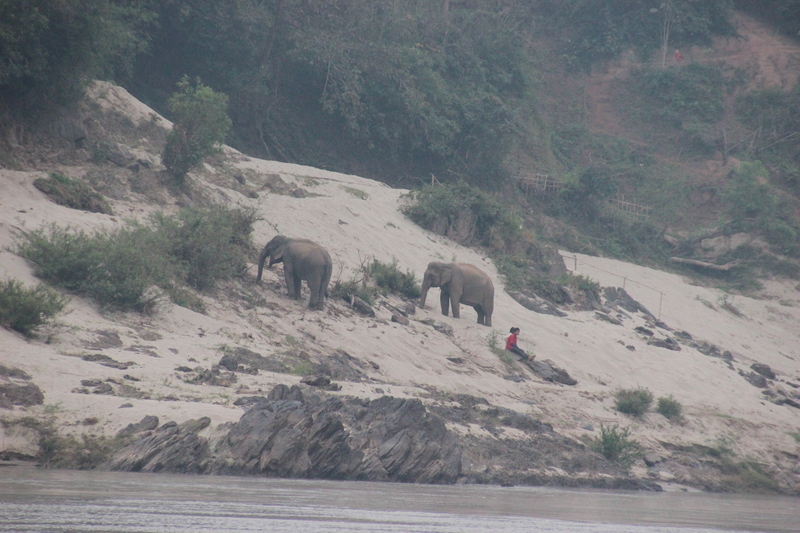 Perhaps it was our limited research, but it seemed that the only guided treks in the area involved homestays with local tribes, something that didn’t really sit within our comfort zone. 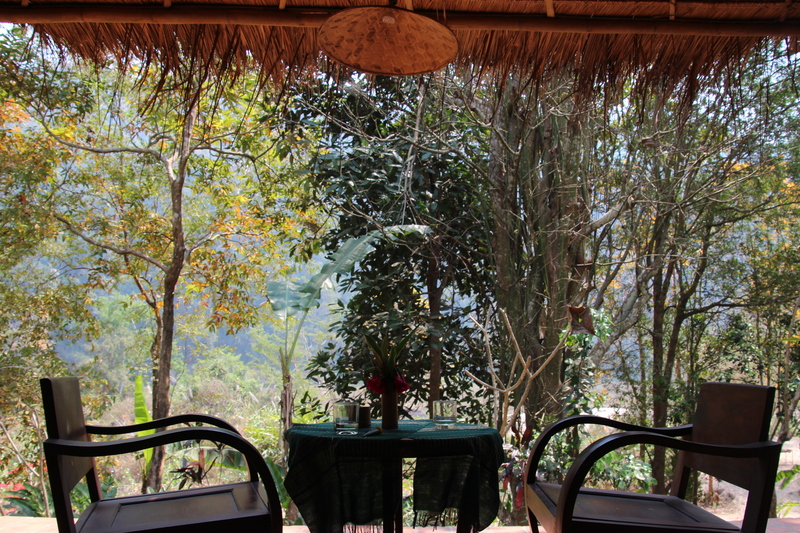 We found what looked like a worthy alternative in the Kamu Lodge – a self-professed camping ‘experience’ in the jungle. It turned out that nothing could really be further from camping, but by then we weren’t complaining! The lodge itself was spectacular in its natural beauty. 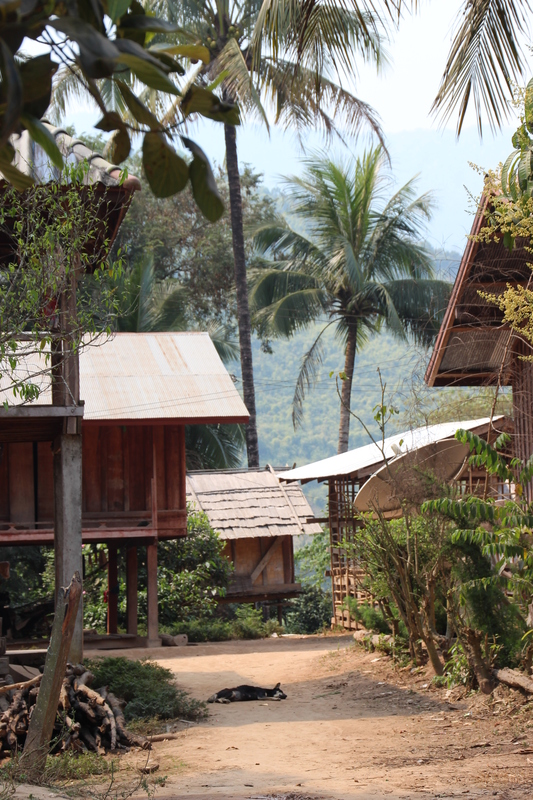 Twenty ‘tents’ (erected on concrete floors, with rustic stone bathrooms, solar-powered showers and bamboo roofs sheltering the actual canvas) stood along a sandy ridge high above the Mekong, which could be spied through the jungle from their individual verandahs. 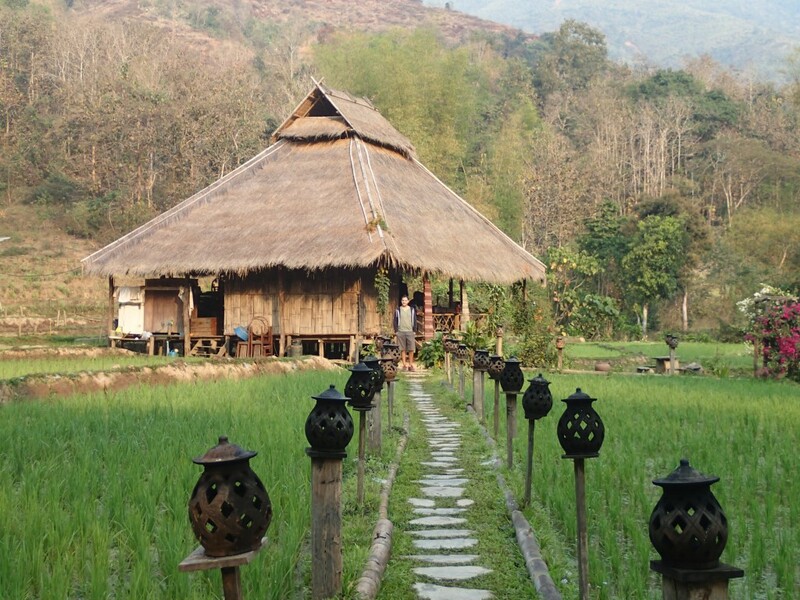 The bar and restaurant were in sala-style wooden buildings, each reached by stepping stone walkways carved into the surrounding paddy terraces, where water buffalo grazed and the local children weeded the crops. 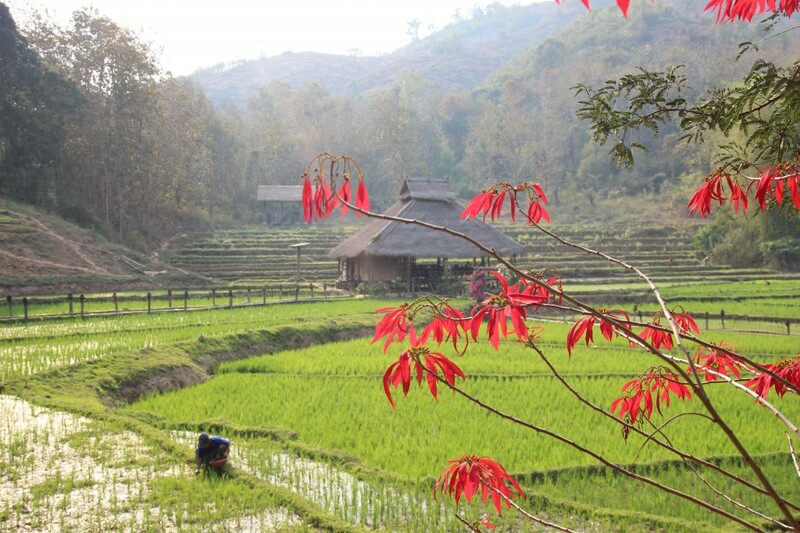 The landscape was lush with green rice fields, bougainvillea and clouds of colourful butterflies. On booking, we hadn’t realised that the Lodge was right next door to a local Kamu tribe, meaning that much of the two-night ‘experience’ would be given over to doing the very things that we’d been hoping to avoid – namely dropping-in on the local village and taking part in local ‘activities’ – but as it turned out the good humour of the local people, many of who worked at and were supported by the lodge, did ease our conscience a little whether justifiably or not. 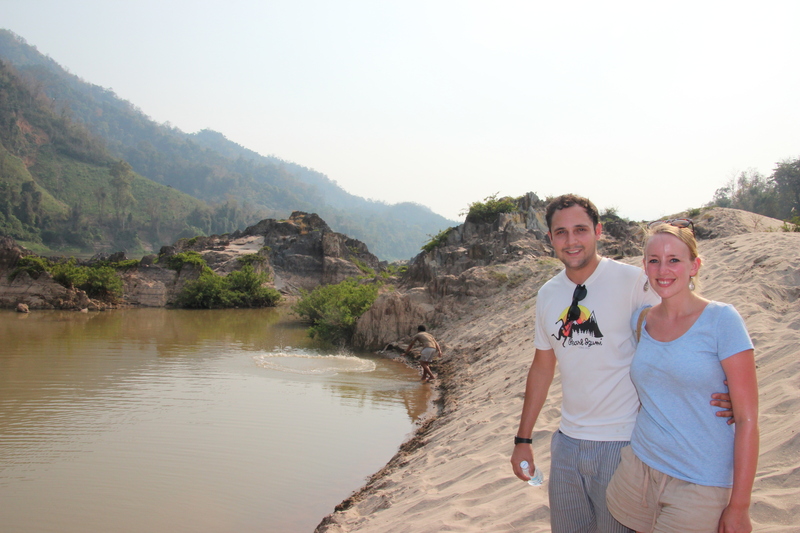 After lunch, our first afternoon was spent with our Laos guide – Mr Lott – and Mathilde, a student in hospitality from Bordeaux who was on a cross between a work placement and a holiday from the sister hotel in Luang Prabang. We started with our trip into the village, where we were able to look round the (strangely empty for a Friday) primary school, and learnt that it was only boys (and then only from families who could afford it) who continued on to high school, as girls were married from the age of around 14. 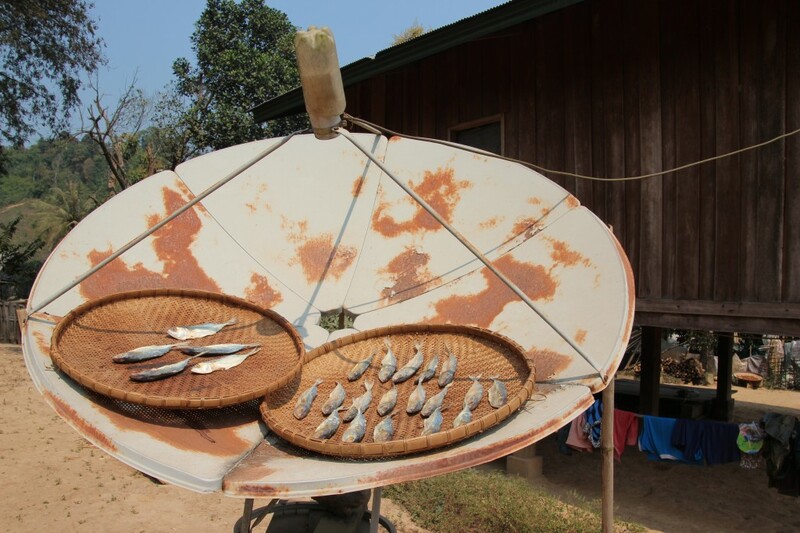 We then partook in the following swift and not-very-enlightening-but-fairly-good-fun-traditional-local-activities: rice-planting; net-fishing; gold-panning; and crossbow shooting, followed by an impromptu game of Petanque. We learnt during the respective activities that the mud in rice paddies is wonderfully squelchily cool underfoot on a hot day; that net fishing is definitely harder than it looks; and that our guide was not so well accomplished on a cross bow as he’d like to be, mainly as all the local people actually do their night hunting with shotguns (he managed to catch a couple of rats with nought but a head torch and a gun the evening we were there). After a dinner during which Nick’s poor choice of bright green shirt had him continuously dive-bombed by flying ugly things the size of a big thumb – we shall call them flying cricketmothcockroachhead-thingys – we stumbled our way down to the beach in the pitch dark, failing in our quest to find the river (it really was very dark) but nonetheless finding a great clearing perfect for stargazing. We were certainly well-placed for it, the lodge being 3 hours downriver from the nearest town, and next door to a village yet to be hooked up to an electrical grid. Too dark to do much other than stargaze we were in bed and under our mosquito nets by 9.30. Rock and roll. Accompanied by a local villager who worked at the lodge and could show us the way, as well as a local dog who could hunt out small animals on the way; Mr Lott, Mathilde and the two of us started our trek early the next morning in the hope to race the sun and get the majority of our walking done in the cooler hours of the day. Though the trekking time was shorter than we’d hoped we certainly stretched our legs as the first half an hour or so was vertically and directly straight up the hill. Climbing very quickly to some stupendous views of the Mekong and neighbouring mountains, we dripped and panted in shame when suddenly behind us bounded two gazelle-like old ladies. They must have been at least 70 and barely drew breath as they strode up the sheer path in just leather soled flip flops. This would not be the first astonishing display of strength and fitness we would see that day – later we passed teenage girls carrying kilos and kilos of rocks across their backs up and over the slippery steep sandbanks – but it was an awe-inspiring example of vitality that made us acutely aware of our complaining limbs. Still, it was a good chance to walk-in our new boots and get in some hill walking practice ahead of our trip to the Himalayas. Along the walk we learnt a bit more about the local tribe and their surroundings, who it seemed had actually moved down from their mountain homes to their present village around 10 years ago (around the time the lodge was built) at the encouragement of the government. Though the walk was steep and took us a good few hours, many of the villagers apparently still head up the mountain to their fields at the top every single day. Luckily we didn’t come across any tigers – apparently the villagers still spot them – or big cats on our walk (Mr Lott had caught one hunting just last month). Hot and grimy with dust by the end of the walk, we rewarded ourselves with a dip in the Mekong. A kind of self-contained water hole afforded us the most peaceful and picturesque private pool, which was perhaps easier to get into rather than out, given the sinking and foot-sucking mud that made up the steep sided banks. Lunch was authentic and largely made up of Nick’s favourite foods: tomatoes, onions and mushrooms. Ha. This came in the form of a tomatoey and oniony fish soup, stirfried pak choi, thickly sliced and meaty mushrooms which were vinegary in their brine, and finally a minced buffalo larb that was saved from its overwhelming meatiness by freshly chopped mint, coriander and spring onions. Refreshed, we were spoilt further in the afternoon by a massage overlooking the Mekong. It was perhaps the most painful massage I’ve ever had – she pummelled my joints until I thought my veins would burst – but I think that means it was one of the best. I certainly felt a couple of inches taller by the end of it (although I do now have a few bruises). 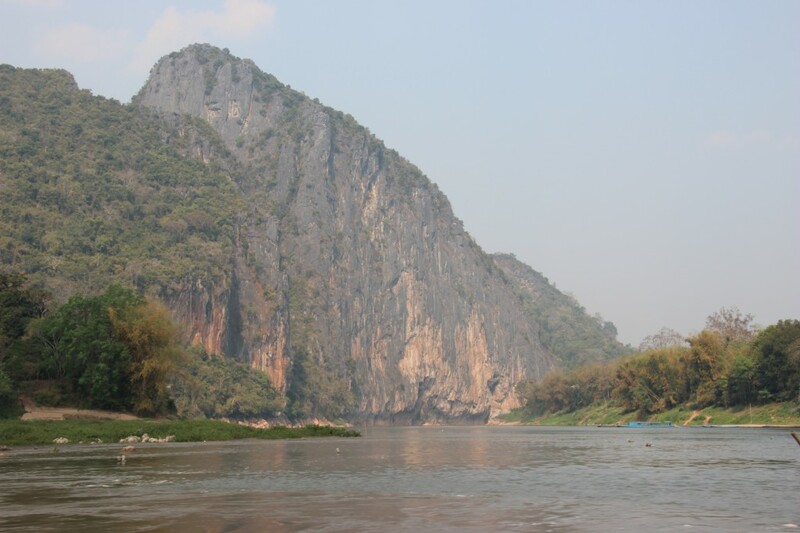 We were sad to leave the next morning, although once again we enjoyed the 3 hour journey up the Mekong, and once again we got to visit the Pak Ou caves, though perhaps a less enjoyable repetition. 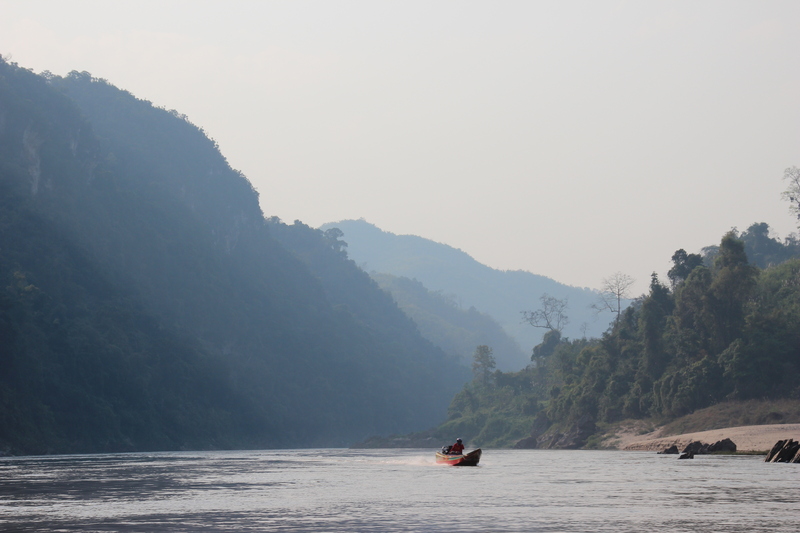 We looked forward though to our stay in Luang Prabang, of which we’ve heard great things – Chris Wensley has even been quoted describing it as ‘the best place ever’, which could well be a deserving recommendation…. BREAKING BAD UPDATE: Still only Series 4, Episode 4. We have been out in the wilderness, like.